Manila, Philippines – Pinoy Boxing legend Gerry Peñalosa opened the newest branch of his self-named boxing gym at the third floor, Acropolis Building in Libis, Quezon City. The grand opening held yesterday, June 4, 2011 was attended by guests consisting of close friends of Gerry and her lovely wife Goody, and friends in the boxing circle. Notable guests were, Congressman Erbie Fabian of Zamboanga City, Mr. Ronnie Nathanielsz (ABS-CBN/Philboxing), Boxing Promoter Elmer Anuran, and International Referee Atty. Danrex Joseph Tapdasan. 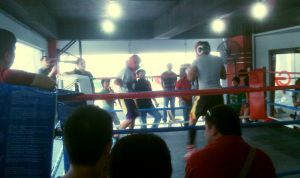 This is the third branch of the Gerry Peñalosa Boxing Gym which has branches in Market Place, Mandaluyong and in Parañaque. According to owner Gerry Peñalosa, the gym aims to discover and help more Filipino boxers and the business aspect is simply secondary. The boxing gym offers world class boxing facilities with the most competent roster of trainers. To Gerry and his very gracious and lovely wife Goody, congratulations and thank you for the very warm reception! 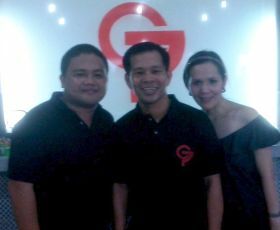 Photos: The author with Gerry and Goody Peñalosa (above) and the boxing ring at the gym (top).